Last week, I received an email from my UK book editor, informing me of changes made to one chapter. The chapter is on international organisations and is meant for students who are thinking of taking up political science, or international relations. As I went through the changes, I realised that while the editing kept true to my original draft, there was one major chunk missing from the chapter. 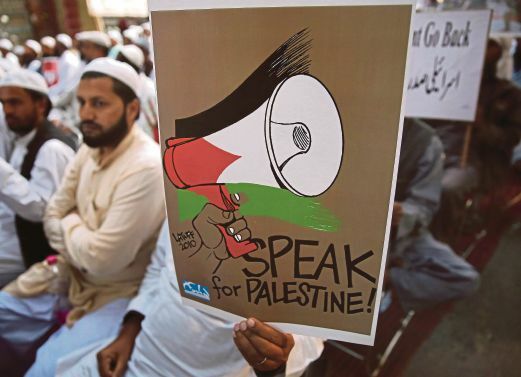 Those were the paragraphs on Palestine, its non-member state status in the United Nations, its struggle at the UN Education, Scientific and Cultural Organisation (Unesco) which led to a suspension of funding from the United States, and its involvement in the Asia Group voting at the UN. True, the edited version did not detract substantially from the overall theme of the chapter. Yet, because it was only these paragraphs on a certain subject that were axed, it was apparent what was going on. The silent censorship regime was hard at work. The events of 1947 and the subsequent 1967-68 war are slowly but surely beginning to be twisted to suit the diabolical interests of a certain group. History is being rewritten even as we are living it. The plight of the people of Palestine, their struggle to live in peace in their homeland — all of this is being obliterated in Western literature. Only the documentaries, news, books, journals and articles that are published in the non-Western world carry the sad story of a people displaced in their own homeland. Already, the mindset of a whole generation of people is skewed towards seeing the Israelis as the victims rather than the occupiers. In Malaysia, and in most of the OIC (Organisation of Islamic Cooperation) world, we watch in horror as crowds of ill-equipped Palestinians throw rocks at the Israeli army who come to demolish their homes. A moment later, even the ground is no more as mortar rockets level the area. In the US, a different story is portrayed. There, it is how peace is always just out of reach, how suicide bombers threaten everyday Israelis going about their business, how the savages on the other side of the wall are always trying to kill innocent Israelis. Very soon the Middle East conflict — as we know it — will be labelled “propaganda”. Only one side of the story will be told. And it will not be the Palestinians. Read the Wikipedia entry under Palestine, and Resolution 181 on the partition of Palestine, and you see a different story from what we know to be true. The power of words, especially in this Internet age, is immense. It used to be that this silent censorship occurred only within the political realm — the newspapers, the news channels, the political discourses. This is changing. Now, even academicians are slowly being silenced. When I was writing my thesis on the responsibility to protect (R2P), included in the first draft was about how the selectivity in applying the concept of R2P would ultimately be its downfall. The argument was that there was no justification for R2P to be applied to cases like Libya and Syria, but not when it came to Palestine. My supervisor, a kindly yet strict Devonshire intellectual, pointedly suggested that the sections which dealt with Palestine should perhaps be toned down a bit. After all, she argued, there was no telling who my examiners were going to be and how they felt about the matter. It would simply not work in my favour if I ended up with a pro-Israeli examiner who would find fault with my work on the basis of those sections alone. After much deliberating and lots of arguments, the sections on Palestine in my thesis remained. Towards the end, as the viva date approached, my supervisor’s worries about my empathy towards Palestine were like a litany in my head. What if the examiner fails me just out of spite? Was it worth it to stand on principle and end up with nothing? I left the sections in, nonetheless. I was banking on the idea that the academic world would be able to see past the imposed censorship levied by an influential group of people. My luck was in — my examiners could not care less about my “political” leanings. They appreciated the perspective the sections brought, and left it at that. Publishing, on the other hand, is a whole different story. So, my chapter on international organisations, on statehood, gets edited. Heavily. If I want the chapter to be included in the international publication, that is the price I have to pay. Funding and political clout are the reasons why editors are hesitant to include Palestine as an example of the oppressed. Anyone who has dabbled in US politics knows how much finance, power and influence is in the hands of Israeli sympathisers. It is the reason why the Arab world gets all the bad publicity. It is the reason why Al Jazeera exists. The International Day of Solidarity with the Palestinian People, commemorated every Nov 29, is not about the Palestinian struggle for statehood. It is about an opportunity lost, and how Arab states’ bickering ensured that Palestine remained in limbo. At least, that is the story the western news media is spinning, if they refer to the day at all. We know better, but our version just does not get told.